compare your use with other homes in your area. To understand how your bills change, compare your current bills with previous ones (preferably over the last year). If you don’t have copies of past bills, contact your retailer and ask them to send you copies of up to the last two years’ worth of bills. 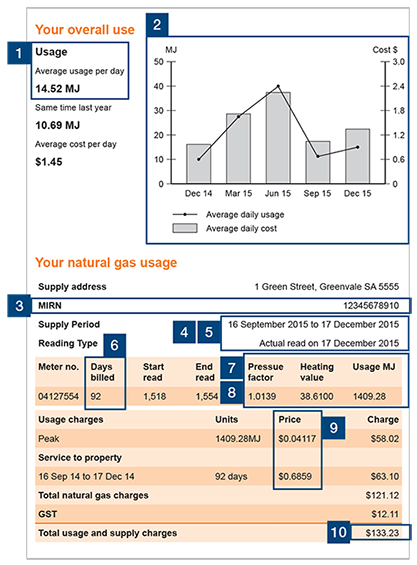 Many energy retailers have online examples of their energy bills to help you interpret your own. If you can’t find one on your retailer’s website, contact them for assistance. This bill is an example of what to look for. Your bill may look different and contain different information - eg if you have a solar PV system your bill will also have information about the kilowatt-hours (kWh) exported. Measured in kWh over the last billing period. 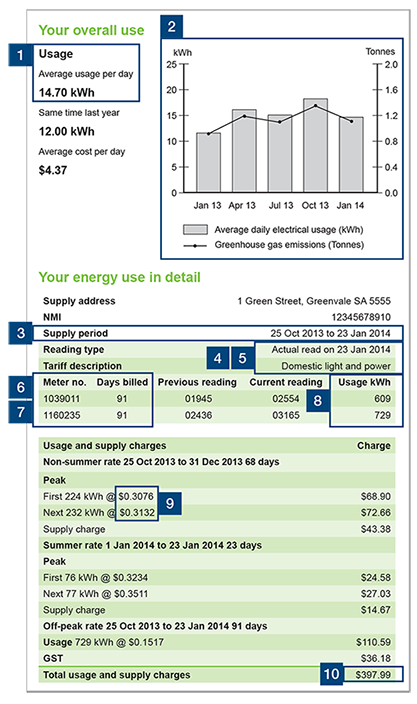 The pattern of electricity used at the property compared to previous billing periods, allowing comparison across billing periods and seasons. The unique meter serial number for the property’s address. This area shows the billing period for the current bill. Retailers can estimate how much electricity has been used and bill accordingly. This may be noted by ‘e’ or ‘estimate’. By law, retailers must do an actual read no less than once every 12 months, which may be noted by ‘a’ or ‘actual’. Many homes have more than one electricity meter, for example, one for peak and the other for off-peak. Refer to the meter number when checking the related reading. A digital meter can record peak and off-peak so may show on the bill as the same meter number twice. Find out more about what appliances are eligible for off-peak tariffs. The number of days this bill covers. If you are billed quarterly, this will be around 91 days. The total number of electricity units (kWh) used per meter. The prices (per kWh) paid for electricity in different periods, eg summer rate, non-summer rate and off-peak rate. The unchanged rate normally refers to a rate that does not change in summer. In this example, it is controlled load, or off-peak. Amount of money owed for electricity supply and usage charges for the billing period and any other charges, eg unpaid amounts from a previous bill. This bill is an example of what to look for. Your bill may look different and contain different information. Measured in megajoules (MJ) over the last billing period and compared to the same period last year. This graph shows the pattern of gas used at the property compared with previous billing periods, allowing comparison across billing periods and seasons. Retailers can estimate how much gas has been used and bill accordingly (noted by ‘e’ or ‘estimate’). By law, retailers must do an actual reading (noted by ‘a’ or ‘actual’) no less than once every 12 months. The number of days this bill covers. For households that are billed quarterly, this will be around 91 days. Gas meters measure in units of volume (m3 or ft3) rather than units of energy (MJ). To convert the volume used to energy used, the volume used is multiplied by the pressure factor and the heating value. These factors are determined by the gas distributor and averaged out over the billing period. The total number of gas units used in MJ. Prices (per MJ) paid for gas. Usage charges will change depending on how much gas is used. Service charge is fixed. The amount owed for service and usage charges for the billing period. May also include unpaid amounts from previous bills. Why is your energy bill high? The most common reason a bill is high is because you have used more electricity or gas than you expected. unpaid amounts from previous bills. The less energy you use, the less you pay for. Do a home energy audit to see how you are using energy in your home and follow our easy energy saving tips to cut down on your energy use. Calculate your appliance running costs to see how different appliances in your home contribute to your energy bills. Billing errors are rare, but they can happen. Is the meter reading on your bill close to what your meter says? For help reading your meter, go to Understanding meters. The Australian Government’s Energy Made Easy website allows you to search and compare energy offers in South Australia to find a deal that best suits your needs. To make comparisons, you’ll need to enter information from a recent energy bill. For the best results, use your last years’ worth of bills to compare your energy use across all seasons. Are you are eligible for an energy bill concession? If you are meant to receive a concession, make sure it has been applied to the bill. If you have recently moved house or switched energy retailers, contact the ConcessionsSA Hotline on 1800 307 758 to make sure you keep receiving your concession. Has the weather been very hot or cold? The average home uses about 40% of their energy for heating and cooling, so if you have been using air conditioners or heaters because the weather has been very hot or very cold, it can have a big impact on your bill. Are more people living in the home, or are you spending more time at home? If you have had visitors, a new family member, or have been home more often for other reasons, the extra heating and cooling, water heating, and increased use of other appliances may add to your bill. Different buildings use different amounts of energy and no two are the same. Heating and cooling appliances and water heaters, which generally use a lot of energy, may be more or less efficient in different properties. There may be less insulation in the building or different types of lights. These things can affect the way you use energy. If your bills are getting too hard to manage, don’t ignore them. Contact your energy retailer if you are having trouble paying your bills, as they are legally obliged to help you find a solution. This could include offering you a payment plan, joining their hardship program or directing you to other services that can help. If you are having financial difficulties, a financial counsellor can help you get back on track. Their services are free. If you would like more information about saving energy or need help working out why your bill is higher than normal, contact the Energy Advisory Service for free, independent advice. The Energy and Water Ombudsman of SA provides more information on understanding high electricity bills or high gas bills.